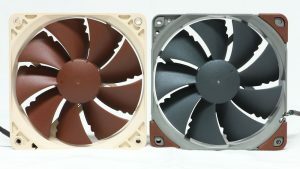 Today we have an opportunity to look at one of Noctua’s fans that made the jump from their premium line down to the redux line in the NF-P12 redux. 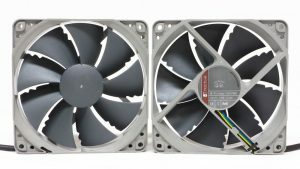 The redux line of fans is intended to have the same performance as the premium line, but sold in an OEM manner (without accessories) to keep costs down. The NF-P12 redux line will include four SKUs – two DC controlled fans at 900 at 1300 RPM and two PWM fans at 1300 and 1700 RPM. The big difference between them is in the price with the redux saving 33% over the fully accessorized NF-P12. The P12 sold well enough to remain a premium fan all these years and sells well enough to be made into four redux fans. 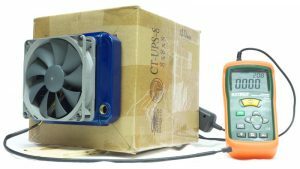 How do the fans function in various environments? We will examine the performance of all four fans and see how it adds up. 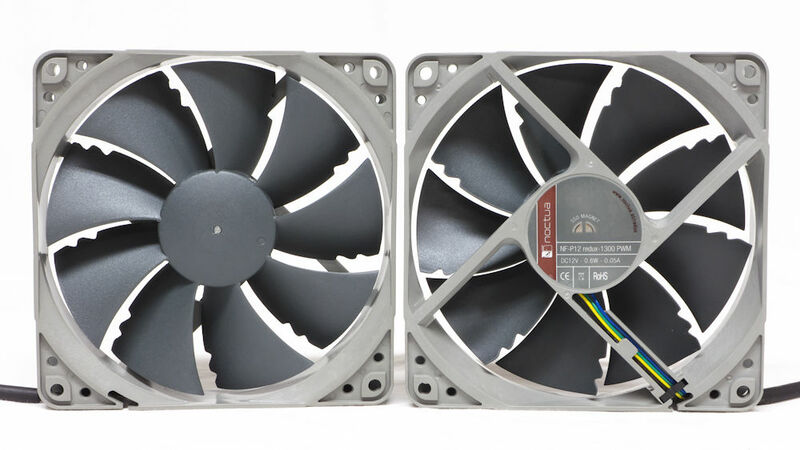 The P12 series has been manufactured with high-pressure applications in mind with Noctua’s use of nine, tightly spaced “pressure optimized” blades on the impeller. Their design also includes vortex control notches which split up the trailing edge vortices. These notches spread the fan’s noise emissions over a wider range of frequencies reducing audible noise making them easier on the ear. 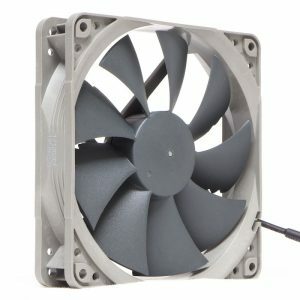 One unique feature of the PWM fans is the use of a silent circuit that makes the once-common clicking sound PWM fans make a thing of the past. The fan is packaged in a cardboard box keeping with Noctua’s theme of simplicity. The next picture shows you the plastic enclosure sheltering the fan from knocks and crunches in shipping. The long power cable and a package of fan screws are under the plastic case. When we look at the P12 redux we notice a few things. One of the first things we can see is the blades are close together making it look like their static pressure was definitely a consideration. 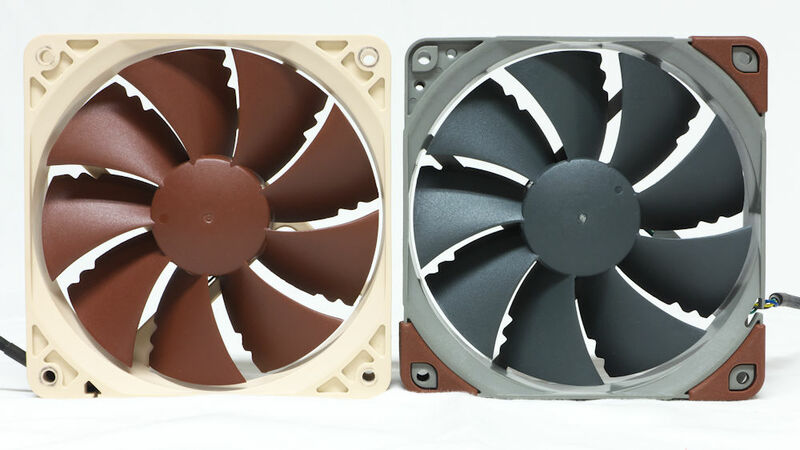 The coloration is not what we are used to in their premium fans in brown and tan, but we see “redux gray.” The blades are not as bent as what we are used to — but really that is not objectionable since there were fans with curved blades when the P12 first came out. One also cannot miss those trailing edge notches. They are designed to change the sound the blades make as they cut through the air, making them more ear-friendly. This explains why this fan sold well enough to stay in production and become four redux fans. 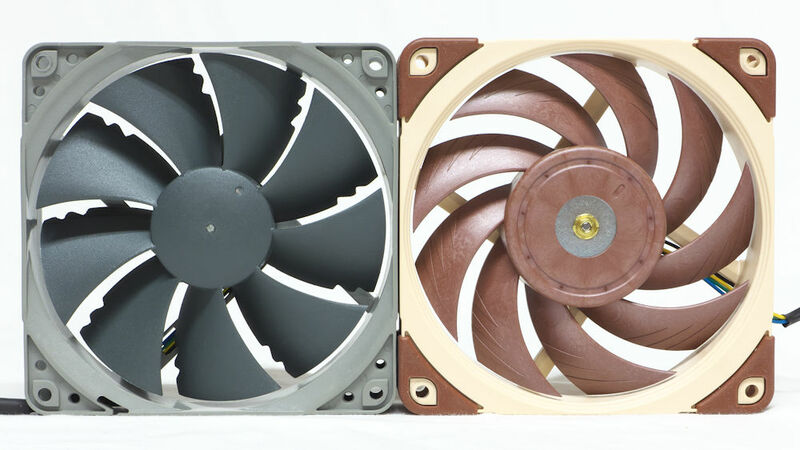 In fact, we can compare the old premium fan with one from the redux line. You can see how the corners have changed to corners that now support anti-vibration pads. In fact, that was a design consideration, with Noctua saying the fan supports their chromax line NA-SAVP1 anti-vibration pads. They are available in five colors (black, red, blue, white, green and yellow) and designed to fit in users build themes. The frames have dual walls flanking the screw paths at each corner of the redux fans. The twin wall pairs point in four directions. Since I just noted that the A12x25 frames had corners that pointed in two directions, I asked the Noctua marketing person about this. He said, “I had to check with our engineers. The corners of the NF-P12 look different because it uses a tooling that opens towards four sides and this is actually the case with most of our fans.” The engineering challenges were different for the A12x25, which accounts for the change. The tips of the fans are closer than contemporary fans, even if they are not as tight as the NF-A12x25 that replaced them. As is fairly obvious, the blades on the successor fan are highly cranked. Both have nine blades, however. The fans were placed in a test stand, where their free air RPM was observed and their noise was assessed. The standard proxy for what you can hear is the Sound Pressure Level (SPL), measured in decibels with a type A-weighting (dBA). A silent room is about 30 dBA. The ambient noise for this set of testing is 31 dBA, sounding like the silent basement that it is. 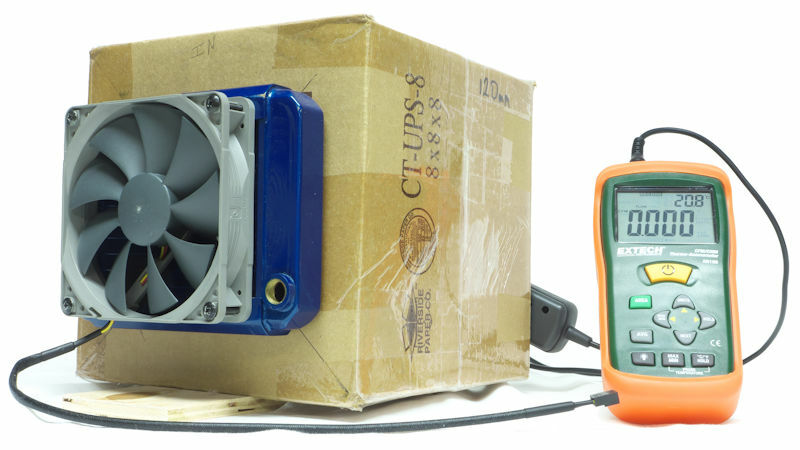 To measure noise levels that were softer, the Sound Pressure Level (SPL) was measured 10 cm from each fan. SPL was adjusted to 1 meter by subtracting 20 dB. The sound pressure meter is a Tenma 72-942. This fan tester has a microphone which is not accurate under 30 dBA. This is the limit of all but the most expensive SPL meters. At low levels sound measurement by extrapolation is not accurate, so that sound measurements are approximate. 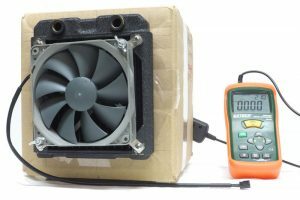 But the bottom line is that fans making a Sound Pressure Level less than 11 dBA cannot be measured without machines costing thousands of dollars. The airflow was assessed using a standard measure, cubic feet per minute, or CFM. The air entered a sealed 8″x 8″x 8″ box (200+ mm on a side) where it was allowed to mix. The air left the box through an exhaust port, where it was measured with the vane head of an Extech AN100 anemometer, averaging 10 readings per fan setting. 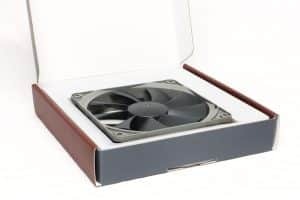 The fans were tested in an unobstructed state, with a metal mesh dust filter, on a 16 Frame-Per-Inch radiator as a proxy for heatsinks and on a 30 FPI 120 mm rad. Note that the HSF proxy leaves a lot of open space on all four sides of the fan. We will look at the performance of the NF-P12 redux’s as case fans. Follow the CFM results by looking at how far the middle bar reaches to the right side. 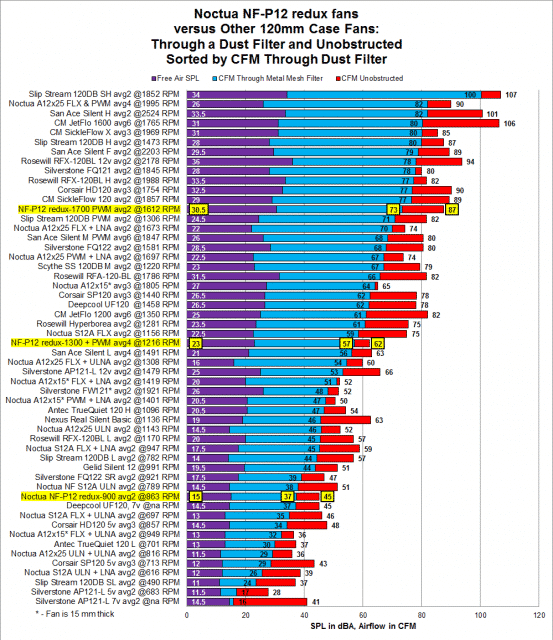 The unobstructed CFM results are what fan OEM’s quote you. They are a bit misleading because all of you use dust filters. However, it is a standard so we include it here. But the middle result is the main result in this chart. BTW – be sure to click on the charts to see them full-sized. Before we move on to the testing results, we must note the P12 still has the feel of a premium fan. The construction is solid. Comparing these results, we see the top A12x25 specimens (second from the top) literally blew past these fans. 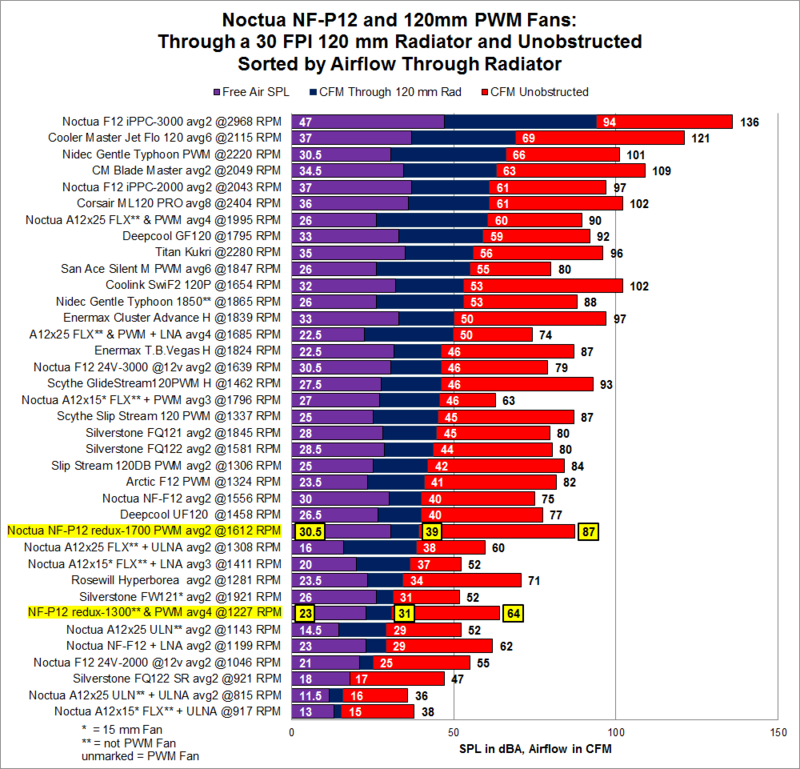 Heck, the NF-A12x25 with LNA was only 3 CFM behind the top P12 fans, while more than 8 dBA quieter! And the S12A fans were comparable to the P12 redux-900. As inexpensive entries, these are not bad as case fans. They compare evenly with their neighbors. Speaking from personal experience, a single P12 can turn your case into a bagless vacuum. I still remember the loud hissing sound that came from every available orifice on a case as a solo P12 acted as an exhaust fan at the rear. So obstructive innards do not prevent this fan from exhausting from or blowing into a case. On a proxy for a heatsink, these fans slotted in with comparable fans. But with those notches, the SPL measurements are misleadingly high. On a 30 FPI rad, the P12 redux-1300 did a nice quiet job of pushing air through a rad. The P12 redux-1700, on the other hand, pushed 26% more air through the rad but made significantly more noise doing so. 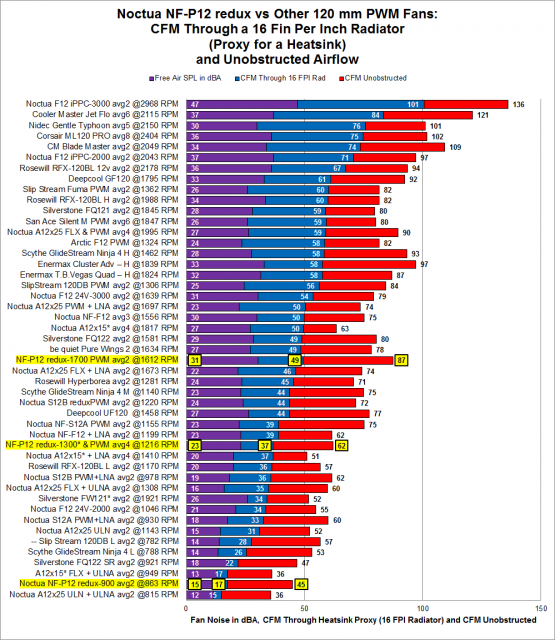 I think the P12 redux-1700 is not much of a rad fan. The redux-900 was not included in the testing because enthusiasts would likely not use one on a rad like this. 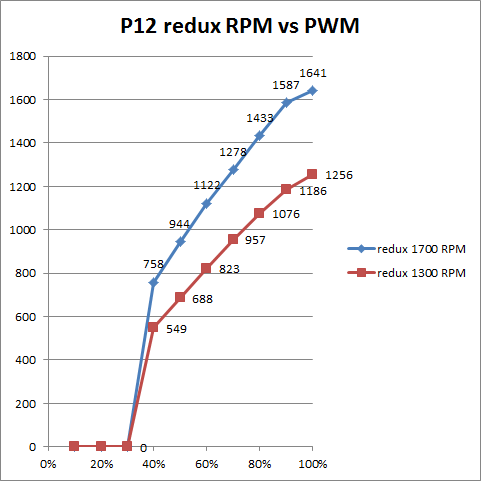 We have some results from speed reducing the P12 redux series with adapters which can be purchased separately. When the results came back the 3-pin RC10 did not reduce the fan speed much, so I abandoned testing with it. Clearly, it was not designed for these fans. I did some testing with the 4-pin RC7 with the results pictured below. It reduced the P12-1700’s results to about the same CFM as the P12-1300. It did drop the four 1300 RPM fans to an intermediate CFM above the P12-900’s peak output (48 vs 37 CFM). The RC7 barely affected the P12-900’s output. Last, we shall look at how fast these fans go at various PWM settings. Remember, the results represent pairs, so the numbers here show you what you can expect from these fans. The results are interesting because the NF-A12x25 (the p12’s successor) starts at 20% PWM, but from 20% to 40% RPM’s do not diverge with or without the LNA. This is puzzling. The P12 shuts down under 40%, so we cannot know if the P12-1300 and P12-1700 PWM curves diverge or stay the same. They simply start out with differing RPM’s. One cannot explain the differences in behavior by citing advances in fan design since the P12 redux had access to the modern circuitry. If you know the answer please comment at the bottom. P12 redux-1700 PWM at Amazon: $13.90. At Newegg: $13.90. 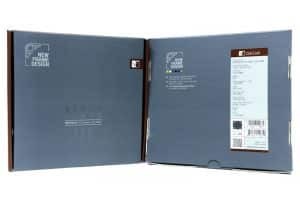 P12 redux-1300 PWM at Amazon: $13.90. 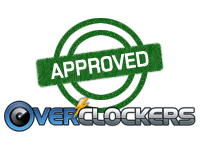 At Newegg: $13.90. 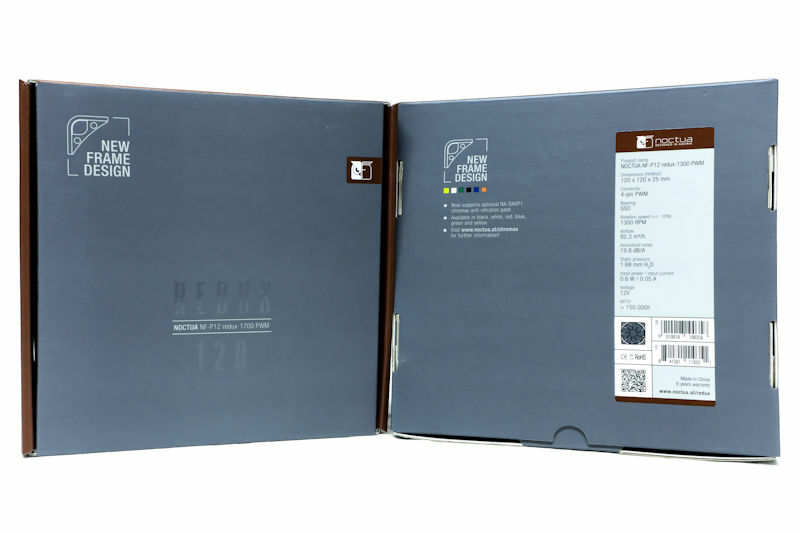 P12 redux-1300 at Amazon: $13.90. At Newegg: $13.90. Time has passed and technology has advanced since these fans were introduced, and it shows. The P12 has a single advantage over the A12x25 – it costs literally half as much. Otherwise, this is an ordinary fan, and it is priced accordingly. I remember a time when this was an extraordinary fan, but the competition has not stood still in those intervening years. The value of the speed reducers can be seen in the P12-1700. 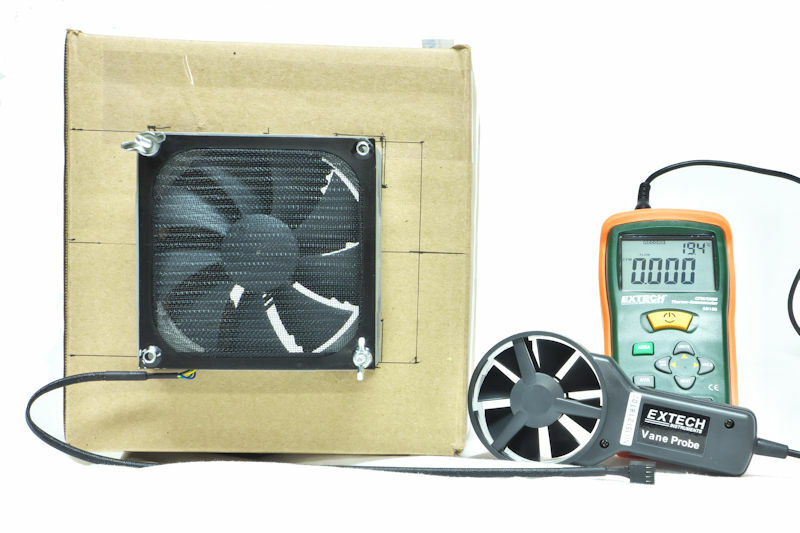 The cost of an SRC7 is half the cost of a fan ($7.95 for three), so if you can’t decide on a redux 1700 vs a redux 1300, get an adapter kit; don’t get two fans. For the P12-1300, a speed between the 1300 RPM and the 900 RPM cannot be reached, only the P12-1300 + an SRC7 will get you there. As for the P12-900 with an adapter, don’t bother: the reduction is negligible. This fan has straight blades. But competing fans had angled blades when the P12 was first presented to the public. Yet despite the straight blades, these fans found a user base. 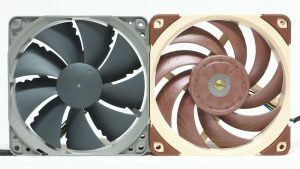 Noctua sold enough of these to keep it a premium fan for years and sold enough to make it into four redux fans now. The explanation must reside in the vortex-defeating notches. Those notches put the lie to any sound pressure levels that can be measured by a machine. The P12 does not sound as loud as a decibel meter measures. What you hear is not what you can measure.